Okay, by reading the title of this post you either think I’ve gone off the deep end or you are pursing your lips in potential disgust. Don’t let the name of this pie fool you. Despite what it sounds like, it’s actually pretty tasty. Yes, it’s got a little tang to it, but not so much that anyone would guess it features vinegar as an ingredient. Imagine a sweet but tangy custard-type of pie. I was intrigued by vinegar pie when I ran across this charming article about it on Money Saving Mom. Shortly after reading the article I made it, really liked it, and have since researched it a little more on my own. 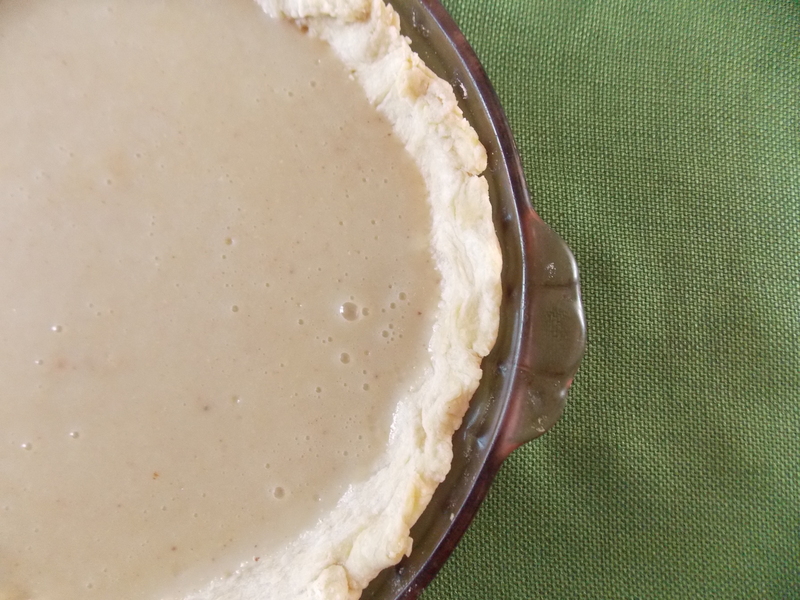 Vinegar pie was made popular back in earlier American history when ladies didn’t have access to fruits and a huge variety of ingredients year round like we do today. This pie was very cheap to make and used a minimal of basic ingredients which they would have likely had on hand. The Little House books even mention Ma making vinegar pie for holidays and such. Through my research, I found a variety of recipes for this, some that used much more vinegar than what this recipe calls for. I think I’ll stick with this one for now as I enjoyed it and am definitely adding it to my repertoire of dessert recipes. Bake pie shells and allow to cool. Bring water to boil in a saucepan. Mix eggs, flour, salt, and vinegar together with a whisk in a separate bowl. When water boils, add filling mixture in. Allow to continue boiling and whisk constantly while it thickens. Wait for it to become thick enough to coat the back of a spoon, then remove from heat. At this point, add in cinnamon and maple and stir to combine. Pour into pre-baked pie shells and refrigerate for at least a few hours before serving. *You can use 3 Cups of water if preferred. This will shorten the preparation time a little bit. *Another tip: The recipe I followed recommends using some type of sieve to pour the finished mixture through, just in case any pieces of curdled egg are in there. I didn’t have any in mine, but I did whisk the heck out of it when cooking the filling mixture. So, do you bake it again after you put it in the shell, or does it just set up in the fridge? Thanks for taking time to answer my question. I’d really appreciate it if you could e-mail me. I read a lot of blog posts.